Last Updated: March 30, 2012 | Subscribe to our weekly newsletter! I don’t have an opinion on either one of these chlorine distribution methods. I personally think they are both good ways of getting chlorine into your pool. As with anything, they have their pros and cons. I’ll list them so that you can decide which method you prefer. Who knows, by the end of this article I might even form my own opinion. Let’s see how this pans out. First, let’s talk about the good ol’ fashion method of adding chlorine pucks to your skimmer basket. No need to spend the money on a chlorinator or chlorine feeder, whichever you want to call it. You can easily tell when the chlorine has ran out just by looking into the skimmer. All dissolved? Time to add more pucks. You can manually control how much chlorine enters you water. One chlorine puck generally treats up to 5,000 gallons of water. No need to open a chlorinator, which can be difficult and full of chlorine gas. It’s not a pleasant experience. No need to keep up on chlorinator maintenance, such as replacing o-rings. No need to worry about winterizing and summerizing your chlorinator. This just adds another step to your opening and closing routine. You have to manually put chlorine pucks into your skimmer, frequently. When the water is not circulating, the chlorine keeps dissolving. It has been know to leak into your pool, through the skimmer door, bleaching your liner if left un-circulated for a long period of time. Allows chlorine to circulate through your pump and filter system, which over time, can corrode your system. Clogs up your skimmer basket with pucks rather than leaving more room for debris. Automatically feeds chlorine into your pool so you don’t have to continually worry about it (duh). Pumps chlorine directly into your pool instead of running through your filter first, saving your filter system from chlorine corrosion. You can add a lot of chlorine at once and control the flow with a dial. You can go on vacation without worrying about adding chlorine to your skimmer basket. It costs money to purchase and install. It requires up-keep, including o-ring replacement. Adding chlorine can be an unpleasant experience. Opening up the lid can be difficult because of pressure and age, and when you finally do it open, a blast of chlorine gas hits your face. Be careful. Both of these methods still require you to add chlorine by hand, which is the sucky part. The only way to rid yourself of adding chlorine by hand is to invest in a salt water generator, but even then, you will still have to shock your swimming pool weekly. I am still up in the air about which method I like better. They both have their pros and cons and some outweigh others. I guess it will be up to you to decide for yourselves. Let me know what you picked in the comments below. Does adding a pool chemical once a year sound too good to be true? Welcome to chlorine stabilizer! 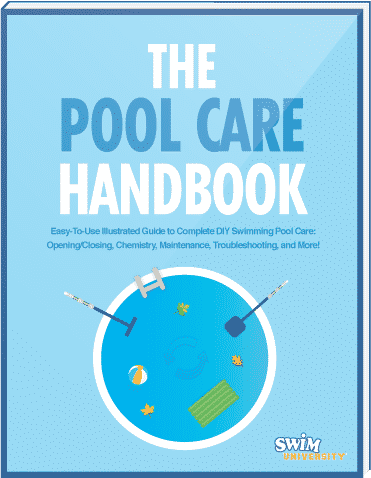 Learn how important it is to your pool's cleanliness. Also called pool conditioner or chlorine stabilizer, cyanuric acid is vital to your pool's chemistry. Learn how and why to include it in your water care. Learn and understand the difference between free and total chlorine so you can better care for your pool and keep those sanitizer levels in check. When's the last time you shocked your pool? If it's been a while, you're laying out a doormat for contaminants. Keep them out with a good pool shock. Is there any difference between powder and liquid chlorine? Read more to learn the differences so you can decide what's best for your pool. Sometimes, when you have a lot of debris and other organic material in your pool, it may require chlorine to handle it. This is called chlorine demand.